One more fight! 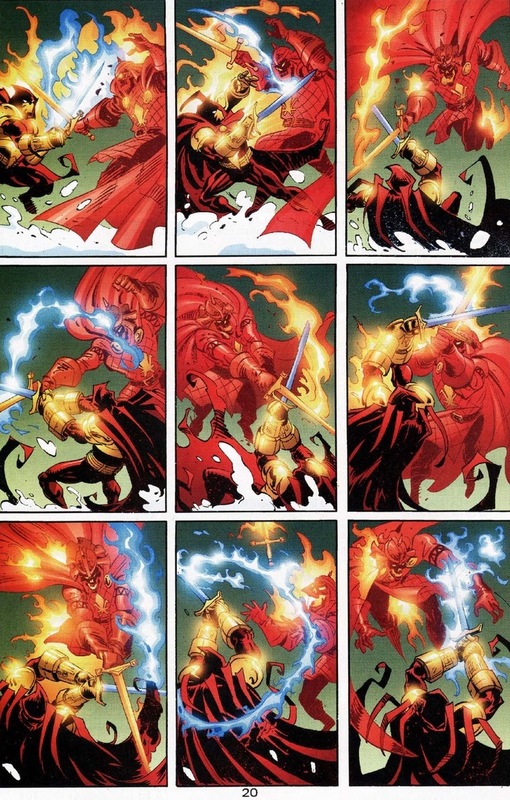 We jump forth about ten years from our last article, as Azrael’s solo series begins to wrap up. Luckily, the years haven’t calmed down the hallucinating, post-traumatic suffering, fanatical religious superhero too much. With everything poor Azrael has worked for spiraling out of control — including his sanity and friendships — only one person can bring Azrael back to the light one final time. Using his fists. 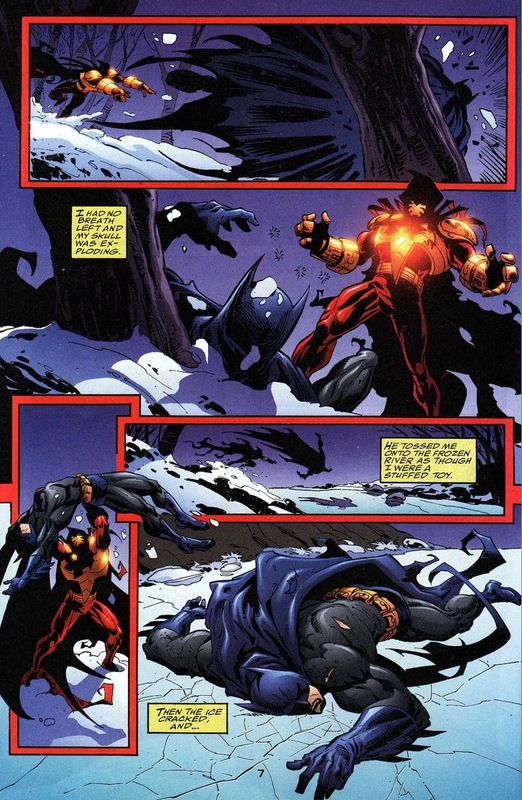 In Azrael #98-99, written by Denny O’Neil and drawn by Sergio Cariello, Batman misinterprets Azrael’s current situation and reacts poorly and violently, like all good superheroes. 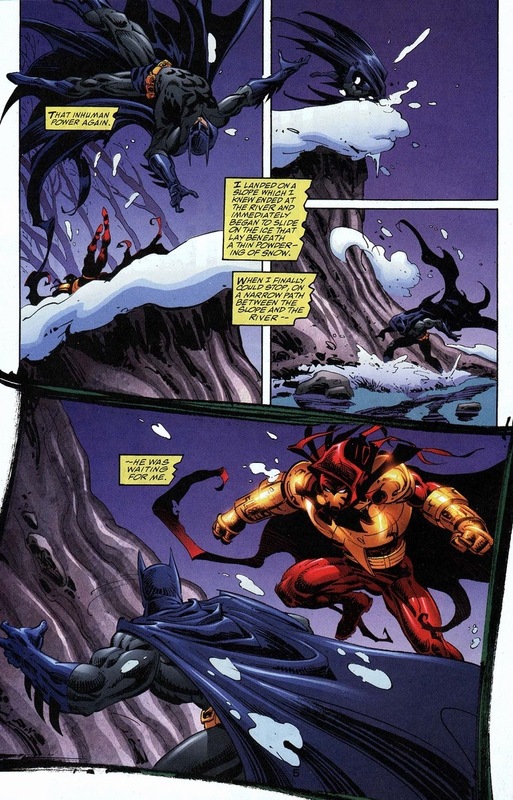 And what did Azrael do to incur Batman’s wrath? 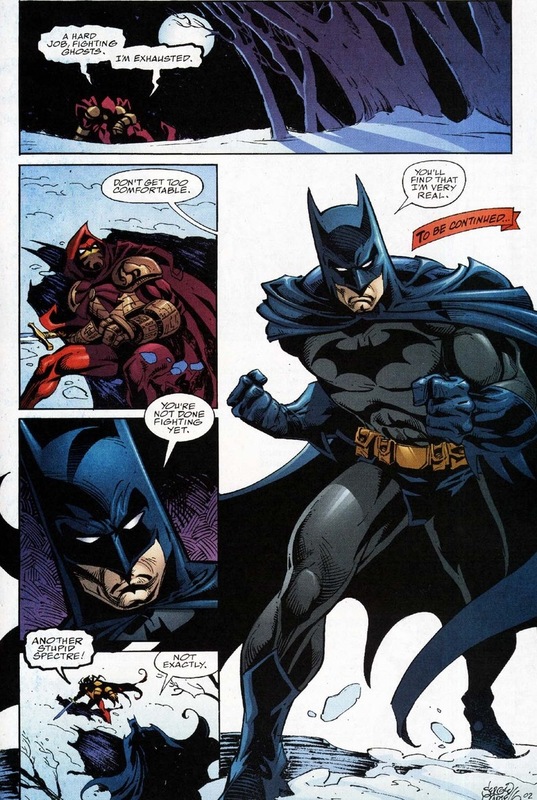 To be fair to Azrael, it was a criminal dressed as Santa Claus, but I have a feeling Batman has been looking for an opportunity to justify his takedown of Azrael for a long time now. 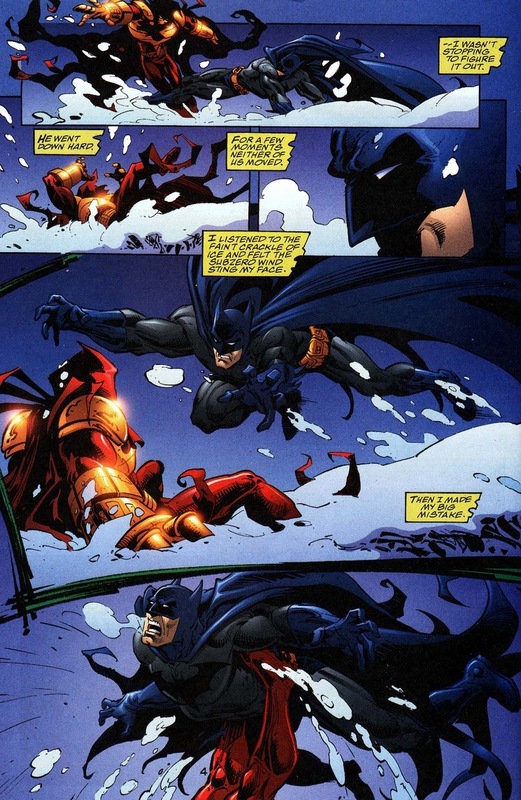 Attacking St. Nick just broke Batman’s back of tolerance, unlike Bane who broke his normal back. The spirit of St. Dumas talks to him, commanding him to do all sorts of terrible things or suffer the severe punishments caused by disobeying. So he swordfights the ghost. It’s complicated. 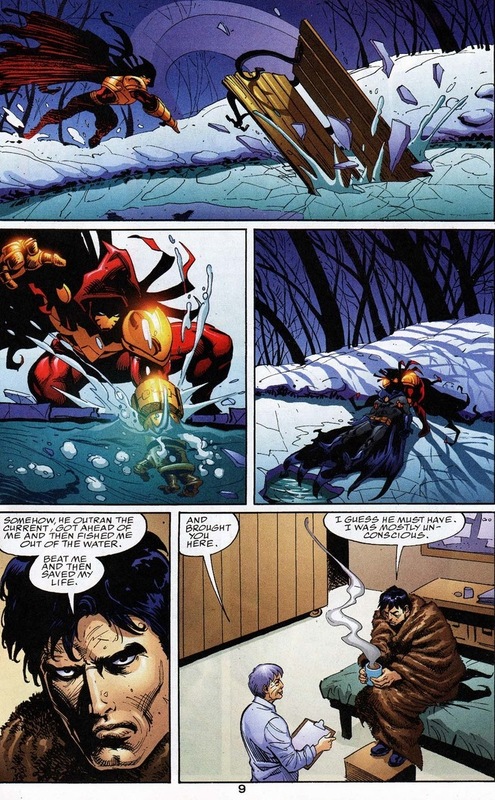 And while Batman slapping Azrael around wouldn’t be so bad to snap our protagonist into a dose of sanity, the Dark Knight’s arrival sparks another global superhero problem: Azrael really doesn’t have time for this — and the time it would take to discuss their feelings or even push Batman’s opinion one way or the other would ruin other far more important plans. 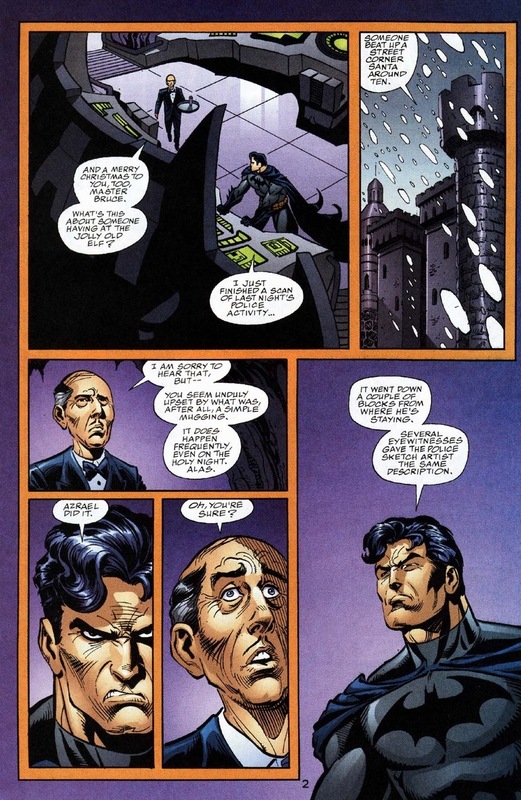 Plus, Batman tends to be a bit stubborn, to put it mildly. Note the similarities in the beginning talk from their initial fight last article. 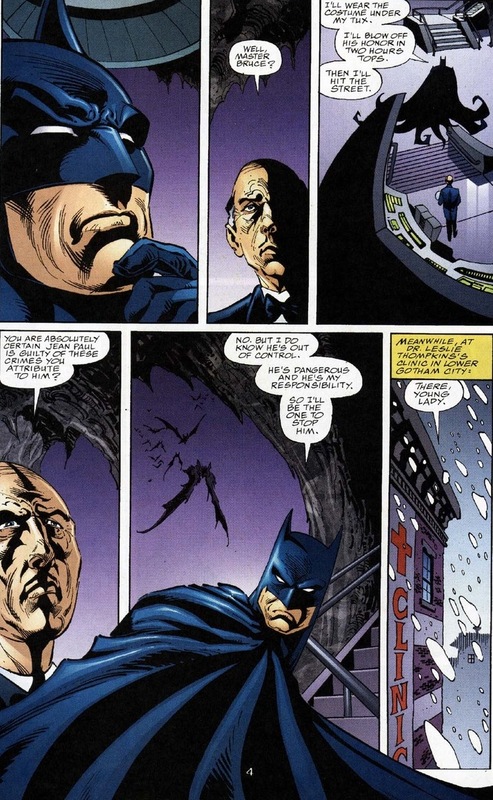 Oh, and the yellow text boxes are Batman’s narrations. 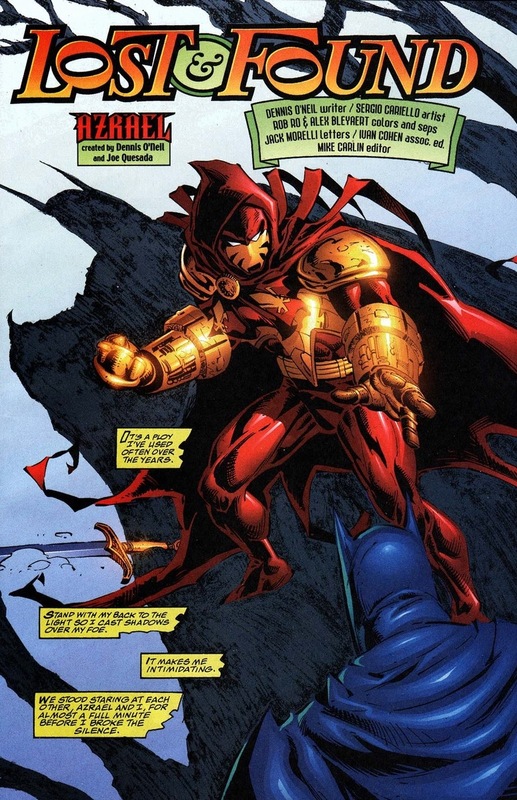 Yes, Azrael becomes the rare exception to Batman’s vigilante group — our buddy has actual superpowers because of the schizophrenic genetic doohickies the Order of St. Dumas fetuses receive. Comics were weird in the ’90s. More importantly, this isn’t the whacked-out Azrael wearing the mecha-Batman costume. I mean, he’s still certifiably crazy, but he won’t be goaded or tricked like last time. Batman has to win this fight the old fashioned way: batarangs and kung-fu movie poses. How beautifully cheesy was that double jump kick in the moonlight panel in the picture above? I am by no means a carpenter, but Google tells me oak’s a tough wood to break, which I assume Batman has punched through cabinets and coffee tables to surprise the bejeebies out of bad guys before, most likely on the other side of the wall right after the henchmen proclaims to his buddy that he thinks they’re finally safe. 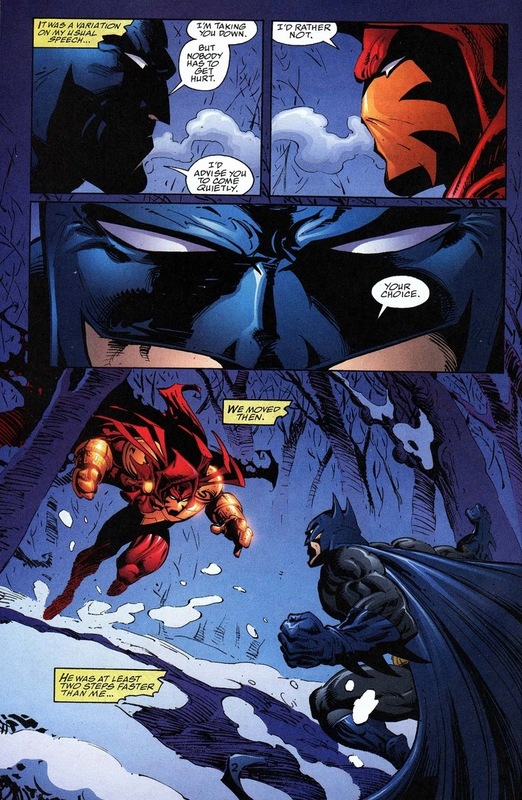 If Batman has an actual weakness, his own reliance on using physical strength against stronger, more durable supervillains like Bane, KGBeast, etc. could definitely count up there with his other weaknesses like healthy relationships and smiling. Let’s learn something valuable today: if you want to battle anybody, it’s always better to battle superheroes. They’re far kinder in the embarrassing aftermath. Azrael, finally free of Batman’s influence, has one final issue of his solo series before it ends — so his freedom’s not terribly lengthy. On Friday, we’ll delve into more Azrael but with something mushier and heartwarming. And punching, but that’s always implied. God this pissed me off. 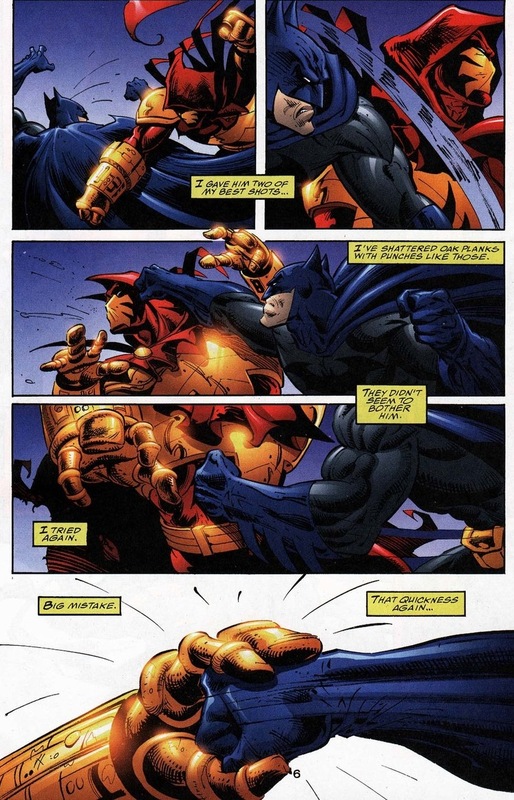 Azrael – beats Batman!?!?! Such crap!!! He’s a delusional maniac! Charles Rocker…. Batman is also a delusional maniac. I used to love Bats, but now he’s like the Calgary Flames of superheroes: As good or bad as he may be, his fans are obsessive to the point that they are obnoxious. They make me not want anything to do with the character anymore. 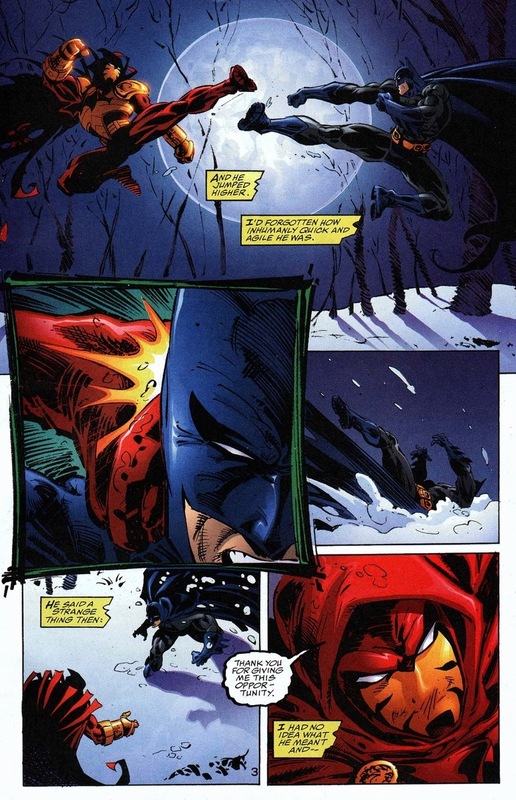 Azrael has superhuman speed and strength, he’s been bred to kill since before he was born, the last time these two fought, Batman won not because of skill or experience, but because he took advantage of Jean Paul’s shattered psyche. Here, all he did was try to beat him up. Could Batman have beaten Azrael? Maybe, but here he was written like a thug. 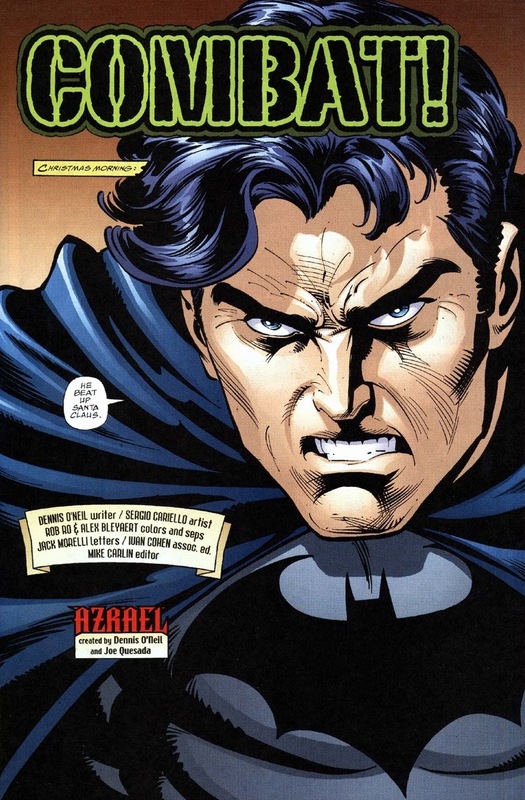 No looking into if Azrael needed to be brought down, no gathering information, no prior planning… just Bats getting on his high horse and saying “I decide who gets to be a good guy in Gotham”. 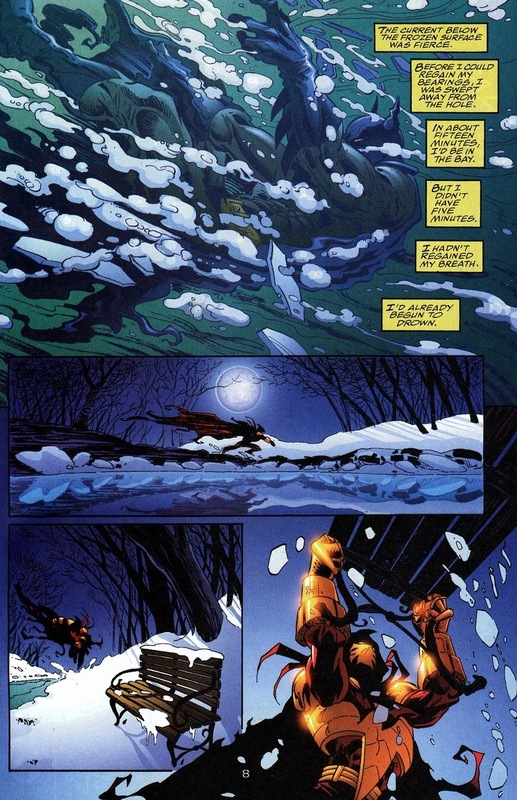 So yeah, the superhuman killing machine who can run faster than river currents through calf-deep snow beat him down. 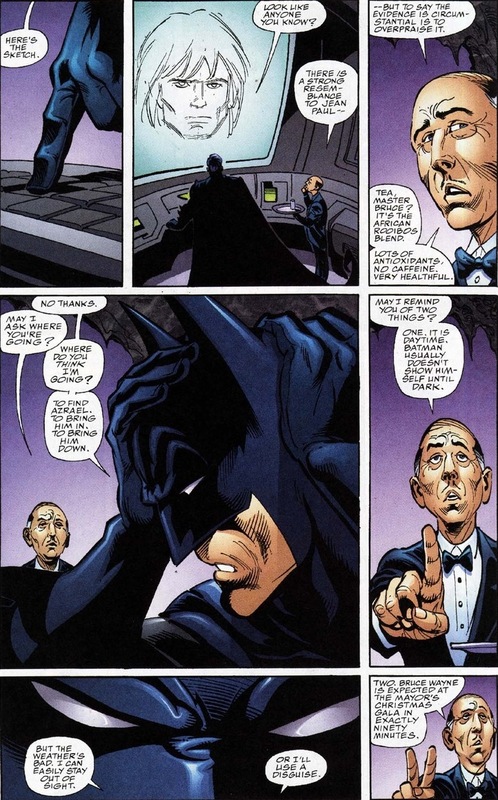 I used to love Batman, but between the fans’ ridiculous expectations of him, and the writers forgetting who he is (a detective, a tactician, someone who actually solves problems by doing more than punching people in the face.) and just giving us tough guy poses and horror movie villains. Batman can and does lose, but he always survives and he always comes back, never giving up. 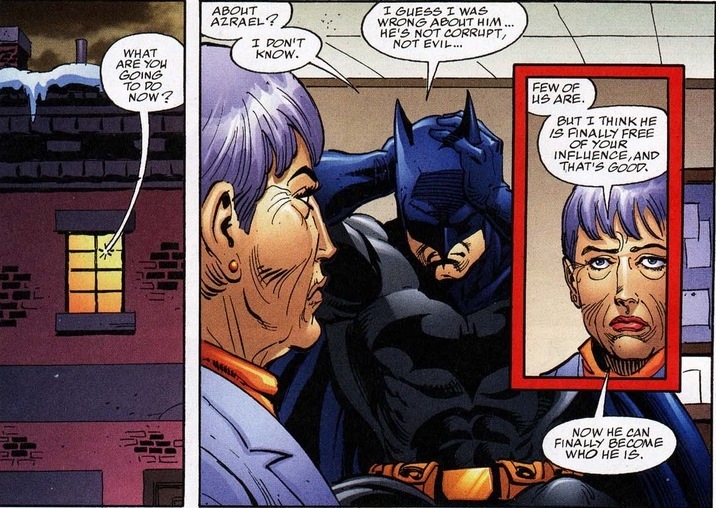 The version of Bats that we are seeing more and more these days is a Mary Sue, he never loses, he beats everyone, and all the hard parts of being him: the constant training, the detective work, analysis of data/clues/information are gone. Hell, he not only condones Jason Todd’s guns and killing, but often works with him, completely forgetting the whole “no guns and killing” code he supposedly lives by.